Okay, two things: (1) holy crap, it’s already October and (2) I’m feeling updatey. While celebrating the former, because we are so over these summer temperatures that won’t go away, I feel like the beginning of October is a good time to stop and take a look at where we are. Also, this update is part of my ongoing effort to get stuff out more quickly. The amount of time I take to put these things together is just appalling to me, so I’m training myself to remember that nothing is ever perfect and not all content has to be earth shattering. So here are the current goings-on in Harpyville and other things that are important to me at the moment. The post-surgical timeline is cruising along pretty well, all things considered. My innards still get sore at odd times of the day and I still get tired stupid easy, but I’m improving. A few weeks ago a hideous amalgamation of strep throat and the Cold from Hell moved in and slowed me down considerably. It also completely screwed up my fitness goals for the year, but we can move those forward. There’s plenty of time to add cycling distance before the weather gets too cold, and then we can move back into the gym. At this point I’ll just be glad to stop feeling like semi-sentient Jello. Talking about recovery makes me think about what caused the need for it. We’re now six months out from the loss, and Bunzilla would have been due on the 26th. Getting to sleep has been a challenge every night for the past few months thanks to the surreal games of What Could Have Been that my brain likes to play when the sun goes down. These games have intensified as that date draws near. They also like to hit while I’m out grocery shopping, which is really annoying. So far I’ve managed not to have a meltdown in public, but it’s been close. Something tells me Halloween is going to be extra weird this year. Work has been patchy over the past year, which was a blessing when I needed time off for health and then something to keep my traitorous brain occupied. A new possibility is on the horizon and it would be a welcome addition to current gigs. I’ve also been easing into a new routine to get more writing done for you lovely people and to be more productive each day. Brian has been helping me a lot with this, both by example (seriously, he’s awesome) and with ideas for stuff to tackle. You’ll be seeing some interesting projects here in the nearish future. My garden has been the main benefit of our bipolar weather. I have to stop and take pictures almost every morning because the flowers are blooming riotously and changing color with each bloom. Yesterday we discovered we even have a secret bonus flower growing beneath one of our bird feeders. 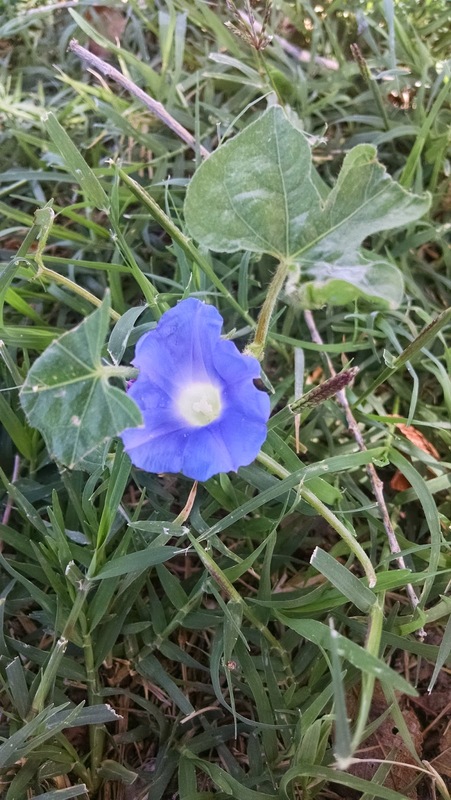 I was a bit surprised to see a morning glory that far from the house, let alone blooming after getting mowed last week, but there it was. Between the planters he built and the natural beds he cultivated, Brian has built me the prettiest garden in town this year. It makes me happy every time I go outside. I realize this update is a bit all over the place, but it’s an accurate account of me at the moment. I’ve never had anything that could be described as a “train of thought.” My process looks more like a kid playing Frogger because the connections don’t make sense to anyone else. That’s a subject for another post, though. It’s time to go walk in the garden and feed our uppity blue jays.